There’s no doubt that President Obama’s White House has been using technology more than any other previous administration. The President has a Twitter account, is using YouTube in innovative ways and has even developed an iPhone app. The White House is releasing some impressive engagement numbers from this week’s State of the Union address. 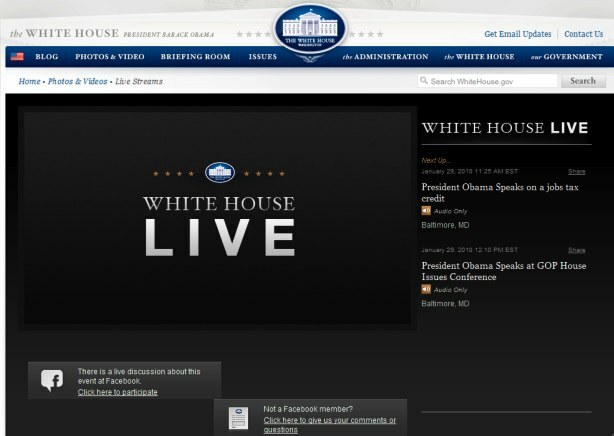 The White House had a live stream of the speech that was embeddable on blogs or websites. Nearly 1.3 million people tuned into the WhiteHouse.gov’s live video feed of the speech, which is a ten-fold increase in traffic over the most popular live-streamed event. Unfortunately, the White House doesn’t have any concrete statistics on the number of unique streams of the speech from the new iPhone App, but says that nearly a terabyte of data was served to iPhones with the application during the event. After the speech, over 50,000 people engaged in a live chat on Facebook. It was just the latest in our Open for Questions series where you can ask questions directly to the officials who work here at the White House. And the President will be holding a live video event next week on CitizenTube to answer questions that people submitted following this week’s address. So far, over 40,000 people have submitted 472,000 votes and 9,926 questions. On the TV side of things, the President’s speech drew 48 million viewers. Of course, the live stream of the President’s inauguration drew a much greater audience, with 3.8 million viewers on the Ustream live feed. MSNBC reported over 18 million streams and CNN delivered over 25 million streams for the inauguration.